Many questions have been raised, in particular to the rushed end of the rescue operation, the total number of people killed and the decision of burying locomotive and carriages of the crashed train right away. These, along with the compassionless and arrogant demeanour of the spoke person from railway ministry, fuelled suspicion and anger, propagated quickly among re-posting Weibo users. Even the arrival of China’s premier Wen Jiabao at the crash site and an on the spot press conference couldn’t calm all the emotions. What the press conference did was to give journalists an anchor to launch attack on the railway ministry, who is not only responsible for the safety of the railway, but also in charge of the rescue mission. For a week, Chinese journalists had almost free run on the story, producing many in-depth analyses and human interest stories, along with bold criticism towards railway officials while questioning China’s high speed rail strategy. The authority, inevitably, responded in the way they knew best. On Friday evening, many journalists posted on Weibo the news that they had received a directive ordering them to strictly minimize coverage of the crash and remove any criticism towards the railway ministry. Many out-of-line mini-posts on Weibo had been deleted at the same time. A lot of journalists reacted by posting the images of the ‘killed-off pages’ of next day’s newspapers. While most of newspapers seem to toe the line, there are exceptions. Some weekly newspapers and magazines were in better position to defend themselves because the next issue had already been sent to printers while the directive arrived. Among them, a weekly business newpaper, Economic Observer (a publication I write for) devoted 8 pages for the train crash and its aftermath. 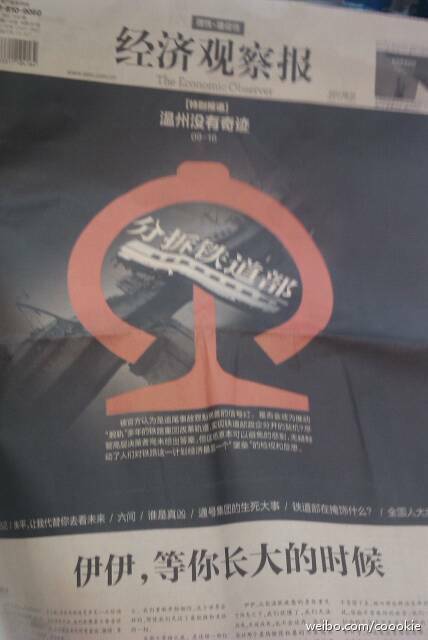 On the front page the headline says ‘There is no miracle of Wenzhou’, clearly referring to a callous remark made by the railway ministry spoke person. Being a business newspaper, it also raised the issue of railway ministry being too powerful, although the suggestion of ‘splitting the railway ministry’ doesn’t sound very realistic. It’s been rumoured in the last few days that the railway ministry’s priority was resuming normal service instead of saving lives, which was denied by an unnamed official. Indeed the normal service did resume within 48 hours of the crash. However after allowing the press to run free in the last seven days, the censors may find it’s little bit more difficult to resume the normal service. lvdphxbufsjol, Levitra vs cialis, mhsOkLF, [url=http://www.cnscorp.com/]Cialis[/url], PoNbkZJ, http://www.cnscorp.com/ Buy cialis doctor online, TfLVToX. I wouldn’t be aware of generate income found themselves below, nevertheless i assumed the following distribute appeared to be wonderful. I don’t fully grasp who you might be but certainly you’re going to any well-known doodlekit when you’re not necessarily already. Kind regards! No matter how lonely you get or http://www.peacockbridalshowerinvitations.com/catalogue/161755621324601629/modern_swirl_peacock_feathers_bridal_shower_invite/ how many birth announcements you receive, the trick is not to get frightened. There’s nothing wrong with being alone.